Silicon Valley Bank and First Data Welcome Class 8 of Commerce.Innovated. 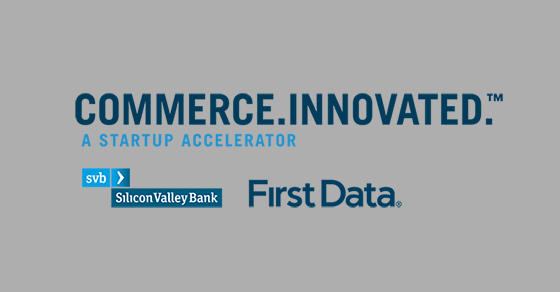 SANTA CLARA, Calif. –– July 18, 2018 —Silicon Valley Bank, the bank of the world’s most innovative companies and their investors, and First Data (NYSE: FDC), a global leader in commerce-enabling technology, have selected five startups to participate in Class 8 of Commerce.Innovated., an accelerator designed to help commerce, payments and fintech companies grow their businesses. The four month program provides participants with operational mentorship from Silicon Valley Bank, First Data and their respective networks. “It is a privilege to work with entrepreneurs in the fintech space and get a glimpse of the future of our industry through the Commerce.Innovated program. Startups drive new thinking and creativity in every industry and our Class 8 participants will be applying cutting edge technology to complex financial businesses to bring simplicity and automation to consumer and B2B financial transactions,” said Chris Foskett, Executive Vice President, Head of Corporate & Business Development, First Data. Commerce.Innovated. launched in 2014 and has worked with 32 commerce, payments and fintech-focused startups to date, including Alloy, Domuso, FutureFuel, Earny, and Splitwise. Since graduating from the program, more than half of the companies in the program have raised funding or been acquired. Full program details are available at www.commerceinnovated.com. For 35 years, Silicon Valley Bank (SVB) has helped innovative companies and their investors move bold ideas forward, fast. SVB provides targeted financial services and expertise through its offices in innovation centers around the world. With commercial, international and private banking services, SVB helps address the unique needs of innovators. Learn more atsvb.com. ©2018 SVB Financial Group. All rights reserved. SVB, SVB FINANCIAL GROUP, SILICON VALLEY BANK, MAKE NEXT HAPPEN NOW and the chevron device are trademarks of SVB Financial Group, used under license. Silicon Valley Bank is a member of the FDIC and the Federal Reserve System. Silicon Valley Bank is the California bank subsidiary of SVB Financial Group (Nasdaq: SIVB). First Data (NYSE: FDC) is a global leader in commerce-enabling technology, serving approximately six million business locations and 4,000 financial institutions in more than 100 countries around the world. The company’s 24,000 owner-associates are dedicated to helping companies, from start-ups to the world’s largest corporations, conduct commerce every day by securing and processing more than 2,800 transactions per second and $2.2 trillion per year.